The red fox (Vulpes vulpes) is an easily recognisable Irish mammal, being very dog-like, with a slender muzzle and long, horizontally-held bushy tail. It is a highly adaptable, unspecialised, versatile species that is found in a wide range of habitats, including urban areas. It is primarily nocturnal and crepuscular (active at dusk and dawn). There are eleven species of the genus Vulpes, which are thought to have split from the other wolf-like canids in the Miocene (12 million years ago). The red fox has probably been a distinct species for the last five million years. It is the largest and most widespread member of its genus and has the widest geographical distribution of any present day carnivore, present in most of North America, Europe and Australia. 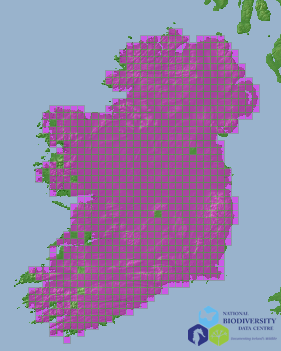 The fox is found throughout Ireland, although the density of fox populations is highly variable. They are most abundant in areas that offer a wide variety of food and cover. In contrast areas of uniform land, such as moorland or open plains, generally carry much lower densities. At high population densities, foxes generally have small home ranges and disperse over short distances. Some foxes become resident in an area and form stable home ranges, whilst others are nomadic and appear to wander from one place to another. Two crucial factors determining the size of a fox territory are the availability of food and the cost of defending the territory. The red fox forms various sizes of family groups that range from monogamous pairs to small family groups. These family groups usually consist of one dog fox and several related vixens, one of which will be the dominant female. The other females are usually the previous year’s offspring of the dominant vixen, and, while non-breeding, may help to rear their half brothers and sisters by guarding, feeding and playing with them. The dominant vixen comes into heat just once during the breeding season, which extends from December to February. The oestrus period lasts for three days, although mating may occur outside this period. Vixens are capable of conceiving 14 cubs in one litter, but in most cases the average litter size is between four and five. In Ireland, most cubs are born between March and mid April. The vixen gives birth on bare soil, normally underground. They are born blind and deaf, but the eyes and ears open between 11 and 14 days and, for at least this period, the vixen stays with them constantly as they are unable to thermoregulate effectively. During this period, she is fed by the dog fox that returns to the earth (the fox’s subterranean dwelling) and leaves the food at the entrance. In rural areas, the natal den can be in the form of an enlarged rabbit burrow or occasionally a chamber in a large badger sett is used. In undisturbed areas the cubs may be born in long vegetation or under dry banks with overhanging vegetation. At approximately one month old the cubs make their first venture above ground, staying in close proximity to the mouth of the earth. By mid May, the location of many earths is quite visible by the appearance of flattened vegetation and an assortment of various discarded food items. The cubs are gradually weaned from approximately six to ten weeks of age, but will still attempt to suckle from the vixen after weaning. The growth of the cubs continues until, by early October, their size is much the same as that of the adults. They are independent by this stage, but can still be encountered in family groups. The typical adult pelage is acquired from about 18 weeks of age. The fox is a solitary animal that does not hunt as a pack. It is recognised as a highly adaptable omnivore, whose lack of dietary specialisation allows it to exploit a wide range of environments: it has been recorded feeding on items as diverse as sand eels, various types of fruit, earthworms, caterpillars, cabbages, and pet goldfish in garden ponds. The results of one fox diet study in Northern Ireland by the author revealed that the two main components of the diet were sheep carrion and rabbit. The fox is not legally protected in Ireland, due its widespread distribution and abundance throughout the island, where it has been the subject of predator control for centuries. More recently, the status of the fox as a pest has remained because of the number and distribution of potentially vulnerable livestock. However, its traditional role as a poultry ‘thief’ is of little economic significance in Ireland today because most commercial poultry producers use battery houses or have limited ‘free range’ operations that use electric fence protection. The main reasons the fox is still hunted are to prevent livestock predation, for recreation and the commercial value of pelts. Of the various diseases to which the red fox is susceptible, the most important are mange and rabies. Foxes are particularly susceptible to the latter and are recognised as being the principal vectors of the disease in the northern hemisphere. Mange in foxes can be caused by two species of mite, Sarcoptes scabiei and Notoedres notoedres. Both burrow into the skin and lay eggs resulting in a rapid multiplication of numbers. This causes an intense itch that ultimately leads to secondary bacterial infections due to persistent scratching and associated hair loss. Infections usually start on or near the tail, progressing in severe cases to cause extensive hair loss and thick crusts of dried tissue fluid exudate, exceptionally over 1cm thick, forming on affected areas. This is accompanied by an offensive odour, with animals in the final stages of the disease losing up to 50% of their body weight and displaying a general listlessness and decreased fear of man. Dr Declan Looney is Senior Wildlife Inspector with the Northern Ireland Environment Agency. His current interest is the impacts of introduced mammals. Identifying feature:Dog-like, horizontally-held bushy tail. Number of young:4-5 offspring, called cubs, born March and mid April.